2012 marks the 100 anniversary of Washington’s most famous symbol of spring – the cherry trees that line the tidal basin and several other spots around the city. In 1912, the first cherry trees arrived as a gift from the Mayor of Tokyo, Japan. 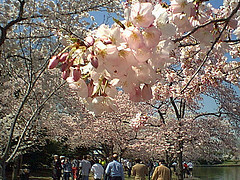 The National Park Service offers Cherry Blossom related events including lantern tours and ranger-led bike tours. Bike n Roll and Capital Bikeshare offer great options for bikes if you’re not traveling with your own bike – just be prepared for the crowds on the Mall. Samurai Cinema at National Geographic as they screen three classics of Japanese cinema as part of the Samurai: The Warrior Transformed Exhibit. The Millennium Stage at the Kennedy Center offers free daily performances at 6 pm (free shuttle buses from Foggy Bottom metro) including kyogen – a traditional Japanese comic theater. The Library of Congress offers curator tours, lectures and a Japanese culture day related to the “Sakura: Cherry Blossoms as Living Symbols of Friendship” exhibit in the Jefferson Building. Plan your trip today (check out the No Worries Weekend Getaway and the Family Fun Package), and be sure to stop by 14K Restaurant & Lounge and enjoy a relaxing drink on the patio while you’re here. Are you in the middle of your training for the SunTrust Rock ‘n’ Roll Marathon USA or half marathon in Washington, DC on March 17th? If you need help to make the most of your treadmill running over the winter, check out Competitor.com for some assistance – Think Outside the Mill: How to Make the Most of Treadmill Running. We hear the DC courses tend to be hilly, so definitely get some hill work in. The final course map will be available soon. Keep up with your fellow runners on Twitter and on Facebook and be sure to share your training tips and advice. When you’re ready to book your room, remember that the Hamilton Crowne Plaza is across the street from McPherson Square metro, right on the Orange and Blue line that will take you straight to the starting line at RFK Stadium (Metro Station: Stadium Armory). We have special rates and packages just for Sun Trust Rock N Roll USA participants. Our Sleep Advantage program will ensure you get a good night’s rest with our plush bedding and special sleep CD. Our guaranteed wake-up calls will get you up and out to the race on time in the morning. 14K Restaurant & Lounge offers great dining options for your pre-race dinner or a relaxing meal in your room after the event. Even though the temperature might drop, things heat up in Washington during January and February. It’s a great time to visit and see the sights without the crowds of summer. This is also the first year visitors will have the opportunity to visit the new Martin Luther King memorial on the National Mall for Dr. King’s birthday. While we can’t control the weather, we can help you control where you get stranded. If you have to “shelter in place” wouldn’t you rather be with us enjoying the lounge at 14K Restaurant and a nice warm bed upstairs? Watch our Facebook page for snowed-in specials. And of course, watch the 14K Restaurant site for Chef Keller’s special Valentine’s menu. 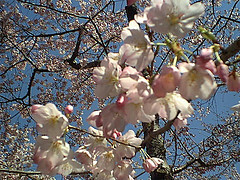 Cherry Blossom Festival – This year marks the 100th anniversary of the National Cherry Blossom Festival. Join the celebrations from March 20 – April 27 including daily free performances at the Sylvan Theater, the Blossom Kite Festival, Family Days at the National Building Museum, the Cherry Blossom Parade, a Japanese Street Festival, and more. 4th of July – it’s always a great time, and we’re within walking distance of The National Mall. Inauguration – I know, I know. But it’s never too early to think about booking your rooms for Inauguration. By the time the election is over, all the prime spots are gone. Stay Monday through Wednesday for only $90 more per night, November 28 – December 14, 2011, and New Year’s Eve is available starting at $179 plus tax. Reservations must be made by November 30 and pre-payment is not required to receive the special rate. Cancellation is required by 6 pm the day before arrival to avoid a 1 night cancellation fee. Weekend rates start at $89 plus tax. Weekday rates start at $179 plus tax. Rates are based on double occupancy. Each additional adult is $20. The hotel offers an on-site Starbucks. Parking is available but not included. 14K Restaurant and Lounge offers a complimentary bottle of house wine with the purchase of two entrees 5 – 7 pm daily. To take advantage of this offer, all reservations must be made through the TravelZoo site using offer code: ILDHK. Learn about holiday activities to enjoy during your stay in Washington. Planning a wedding can be overwhelming for many couples – especially if you’re trying to plan a wedding in a new city or on a budget. We asked local wedding planner Cara Collins for her favorite wedding planning tips and suggestions to help couples planning their big day. How long in advance do you advise brides to begin scouting their wedding and reception venues? I suggest brides begin researching wedding venues at least a year before their ideal wedding date. Most venues book up 9-12 months ahead of time, and once you’ve chosen your venue and finalized the date, you can begin booking your other wedding vendors. Photographers also book up well in advance so book your venue and photographer first thing! What are some trends you’re seeing in weddings this year? Vintage-themed weddings have been all the rage for the past year, and I don’t see that trend ending any time soon. Vintage weddings just seem to have a more intimate feel, and some of the antiques can be borrowed from your guests, making everything more personal and inexpensive! Another new trend that’s catching on is a monochromatic color scheme in white, ivory, or neutrals. Brides are even choosing these colors for the bridesmaids’ dresses, which is very modern, and a look I adore. An all-white wedding looks so fresh, ethereal, and elegant. What’s your best tip for staying in budget? Choose your top three most important pieces of your wedding. Try not to skimp on those, and find ways to budget with everything else! There are so many wonderful DIY projects out there which not only save you money and add personality to your wedding, but these projects can also be a fun thing to do with your husband-to-be or bridesmaids! 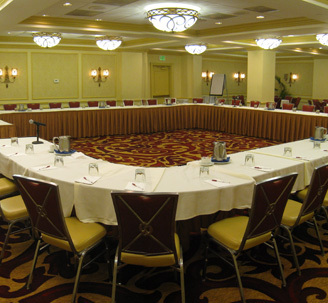 Also, choosing a venue (like a hotel) that has their own tableware, linens, chairs, etc. will save you a lot of money compared to choosing a tent or an empty hall. While tenting on a property can be very beautiful, you need to rent EVERYTHING so it is not exactly budget friendly. Another trend that saves money is opting out of a traditional formal sit-down dinner and choosing to have an informal cocktail party or a backyard BBQ style dinner. Everyone loves a mac and cheese or mashed potato bar, and food like this can save you a bundle! If you could tell brides one thing, what would it be? Enjoy your wedding day and don’t stress about the little things. This is one of the most exciting days of your life, and a day to spend with your most cherished family, friends, and of course – your new husband. 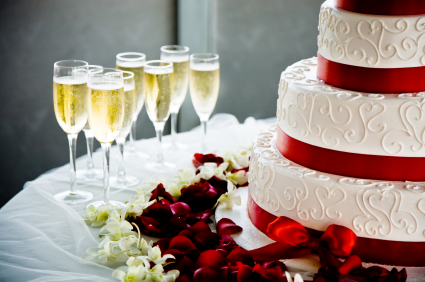 Hire a planner to take care of the details so you can relax, get married, and dance! The Hamilton Crowne Plaza is a great wedding venue – for a wedding ceremony, a destination wedding reception, a place to host your wedding guests or for your wedding night stay. Contact us to start making your plans. You are currently browsing the archives for the The Hotel category.